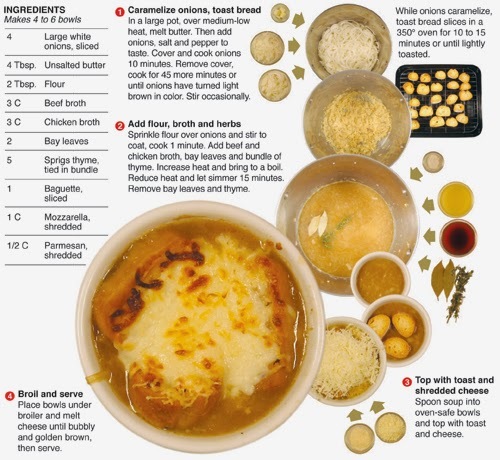 Three years ago I made a french onion soup for the print column and decided it was time to revisit the classic and try and improve on my original take. I went with red onions as an experiment and threw in a jar of diced roasted red pepper for extra flavor. That combo on a sandwich is yummy and I thought it would work in a soup. I added Italian seasoning and oregano along with an equal part combination of chicken and beef broth as a replacement for the veal broth in traditional French onion soup. All the elements for a great soup were in place and for the most part I did like it, but in the end I think it needed more work before I document it in an information graphic. The biggest flaw was the onions, I used at least double the amount I should have and I'm not sure if red onions are the right choice for onion soup. I do think it is worth sharing and I hope to revisit this again sometime, if those of you out there in web land have any suggestions or tweaks I would love to here them. If you like what you see in the recipe give it a shot. 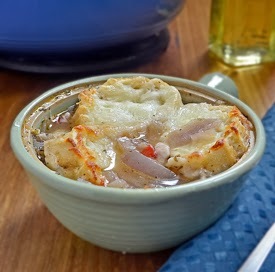 In a large soup pot or dutch oven melt butter over medium heat, add onions and cook until onions have released sugars and have cooked down, 45 minutes. Stir occasionally. Add red pepper and seasonings, cook until pepper is soft 3 to 4 minutes. Add broth, bring to a simmer and cook 15 minutes more. Remove from heat and spoon into oven safe bowls. Top with thin sliced pieces of baguette and shredded cheese. 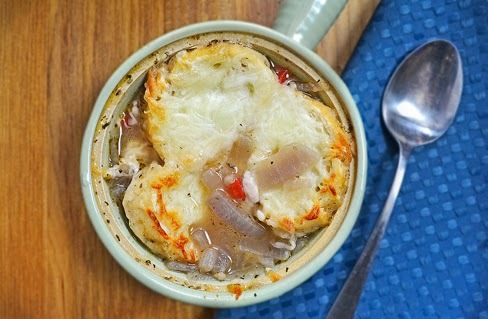 Place under a broiler and cook until cheese is melted and bubbly. Remove from oven and serve.